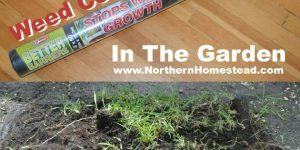 Preparing the garden for winter, a time when gardens go dormant. 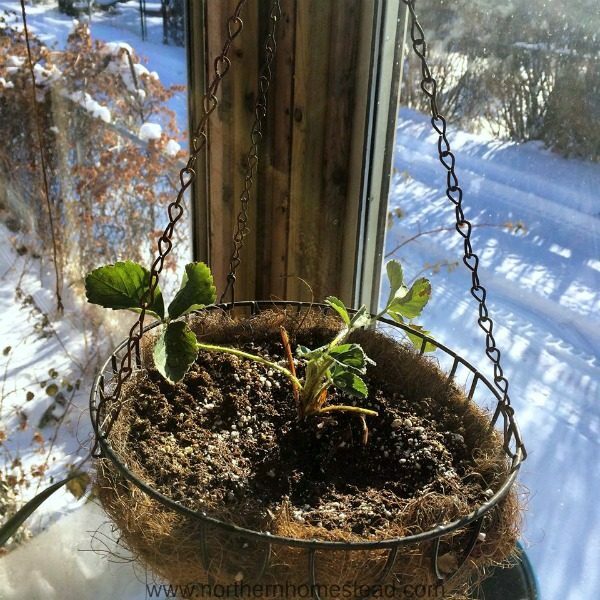 Winter is an important time for the garden and the garden soil. 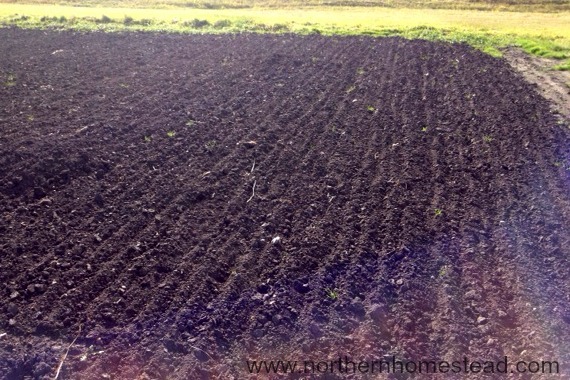 You might have noticed that the colder an area is, the richer is the soil. 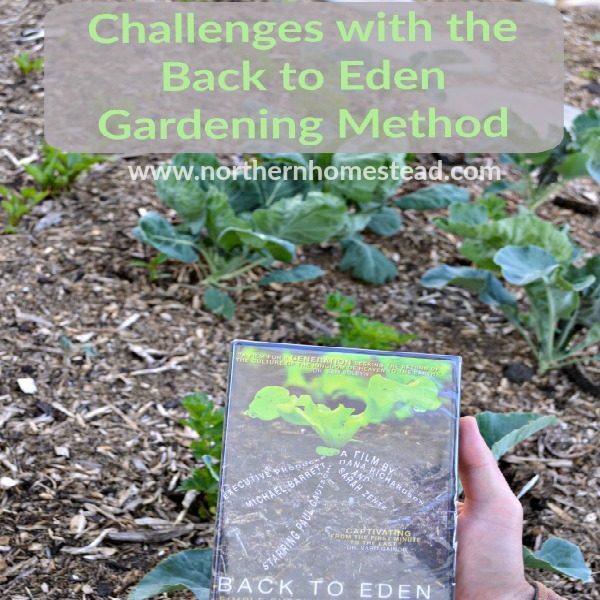 There are a few important steps that can make the garden soil even better and also help the perennial plants to survive the cold winter months. 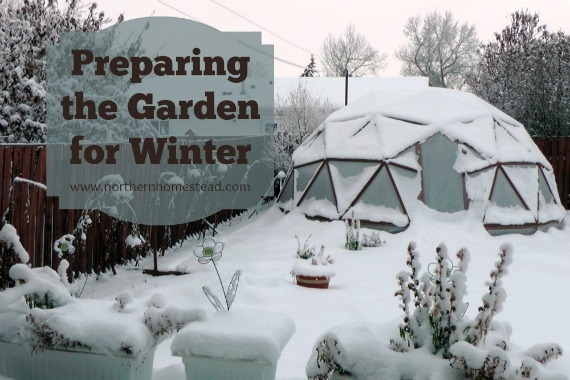 Before winter settles in for good, make sure that you prepare the garden for winter. 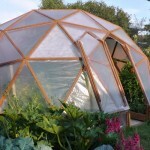 Before the frost kills everything, you want to make sure that you harvest your produce. After all, that’s why we grow a garden, so we can harvest yummy foods. However, frost does not kill every plant alike. See how different plants react to frost. Do not rush the harvest! Cucumbers have to go first, they do not tolerate any frost. Tomatoes and peppers will be next on your list. See how to ripen green tomatoes indoors. Carrots become sweeter with lover temperature and can be left in the ground with protection, learn more at growing food – carrots. Brussel Sprouts become more tender after there is a real freeze. Only when outdoor temperatures drop to 0 °F (−17.8 °C) is the garden done. You want to harvest everything before that. If your area does not get temperatures that low, or it is just an unusual event, you can keep harvesting all winter long. Learn more about it: The Winter Harvest Handbook: Year Round Vegetable Production . 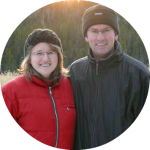 Here at Northern Homestead, we talk about winters that are much colder than that. 1. Greens. 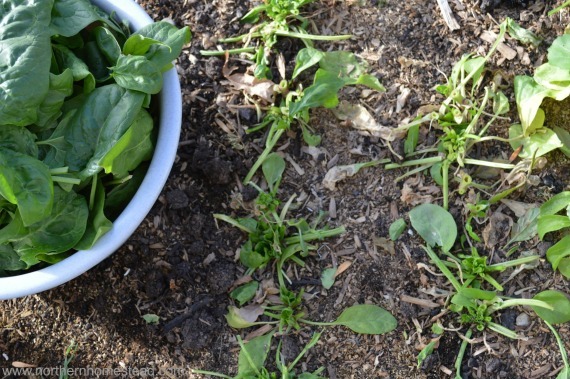 By harvesting greens, cut the tops and leave the roots in the ground. You never know how many will survive the winter and continue to grow in spring. 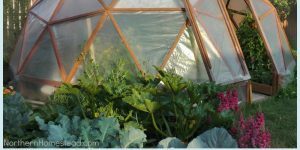 These greens will provide you with early salads and will protect the soil from weed overgrow long before you can get to the garden. Spinach has survived unprotected in our Zone 3 garden. We actually plant spinach in August with an early spring crop in mind. 2. Legumes. Legumes (peas, beans, peanuts, lentils, alfalfa) are nitrogen fixers. In order to take advantage of this wonderful natural fertilizer, you have to make sure to leave the roots in the soil. Again, just cut off the tops and toss them into the compost pile, but leave the roots in the ground. Learn more about it: How to Clean After Peas in The Garden – What You Need To Know. No this is not spring, this is fall. Does your garden look like this? 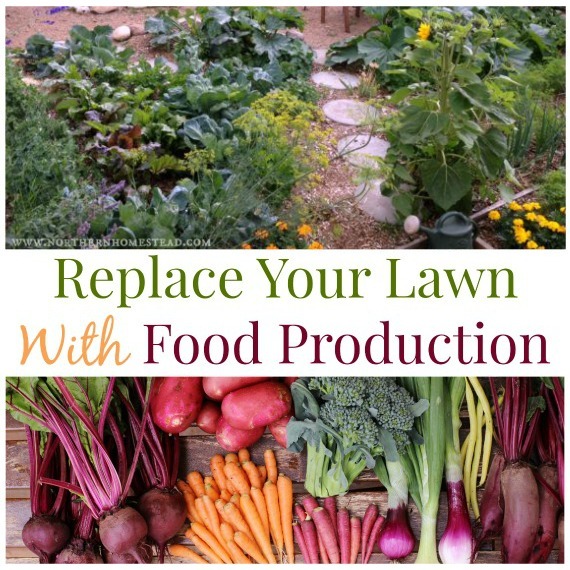 If yes, you are on your best way to ruin your garden soil. 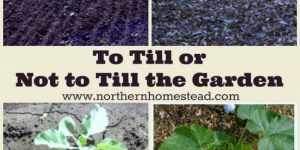 Read more at To till or not to till the garden. Think about this, God created leaves that fall to the ground in autumn. I am sure in His wisdom, God could have made leaves just turn color, for autumn yellow, for winter white, for spring pink and green for summer. Wouldn’t that be pretty? And we would not have to clean up the mess in the autumn. But no, God made leaves fall. Since God is all knowing and also loving, I am sure he did not want to make a mess for us to clean up. That’s just not how God is. It looks like He wanted a cover for the soil to keep it warm and nurture it at the same time. We think we need to clean the cover up though. Worse, we even till the soil for winter. 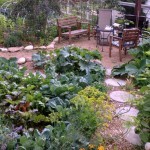 Garden soil is a living organism, it gets cold too. A garden clean and exposed for the winter will struggle. Microorganisms will die. Worms will look for a new home. Beneficial insects will leave your garden. And part of the soil will be blown away by the wind. The garden soil will get depleted. However, if we cover the garden the soil will get better every. single. year. How much material and what to use for a cover you might ask? 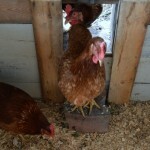 You will need 1-2 inch (3-5cm) of compost mulch. Keep in mind that there is no need to turn the soil either in the fall nor in spring. 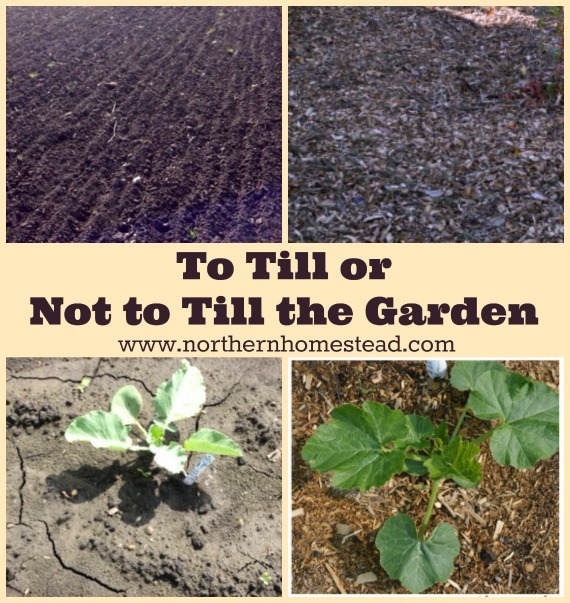 It turns into a no-till garden right away. The best and easiest to work with cover is compost. 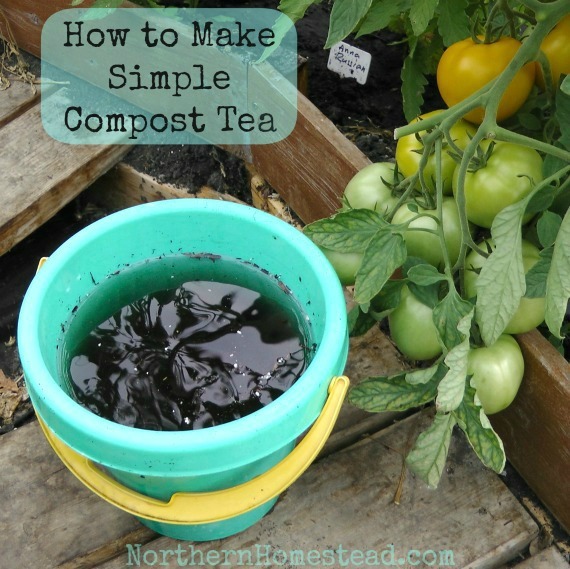 It can be an all plant compost or a mixture of well-rotted manure and compost. 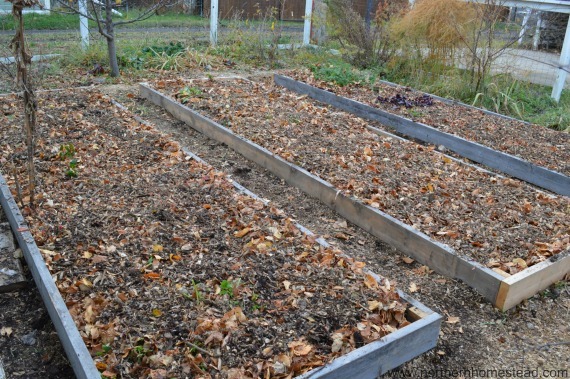 In dry climates, wood chips work well for mulch, make sure you use the right woodchips for the garden because you will be planting into them in spring. 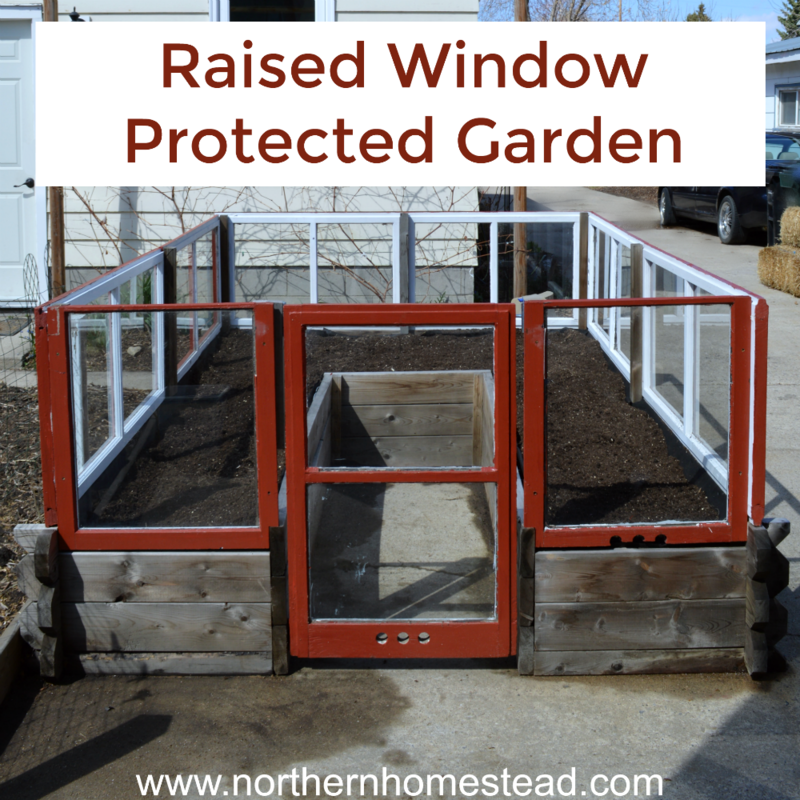 Covering the garden soil also helps the perennial plants to survive the winter cold better. Mulching helps to prevent winter kill. 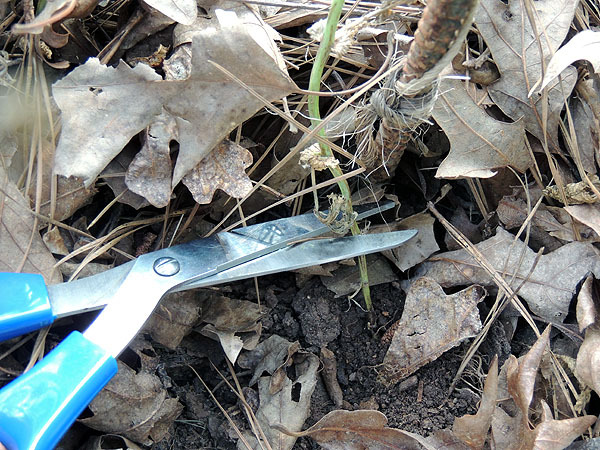 If you have tender perennials, gather more leaves around them. We cover our blackberries, kiwi, and lavender plants with bags filled with leaves. This leaves will be great all summer for composting, too. Strawberries can be buried under mulch. In the spring only healthy plants will make it through the cover, giving you a healthier patch. Do not worry about cutting back perennials or cleaning up the leaves, plants survive the harsh winters better if you leave both. When you put a perennial plant to sleep in the autumn you want it to have a frozen root ball. That way when it wakes up in the springtime the roots will have a lot of access to water. 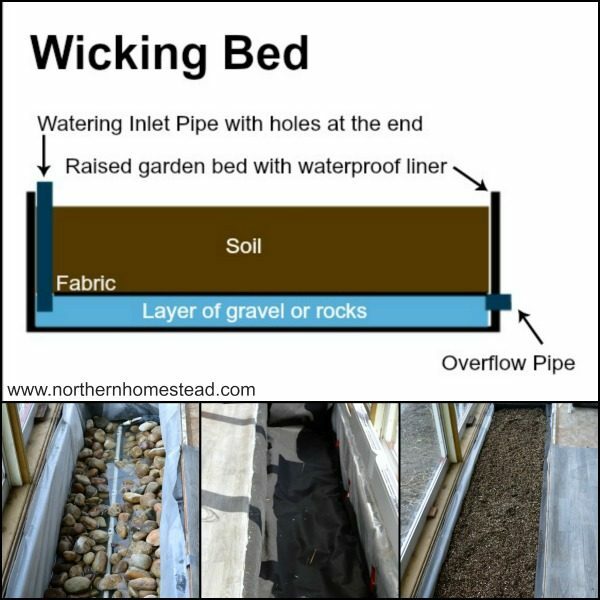 Since water gathering systems need to be emptied for the winter anyway, this is a good use for it. 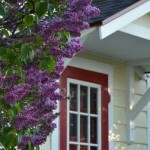 Just before the ground freezes, water all your trees, shrubs, and perennial plants. As soon as snow covers the ground, it is also a good idea to hill up some snow around precious plants. 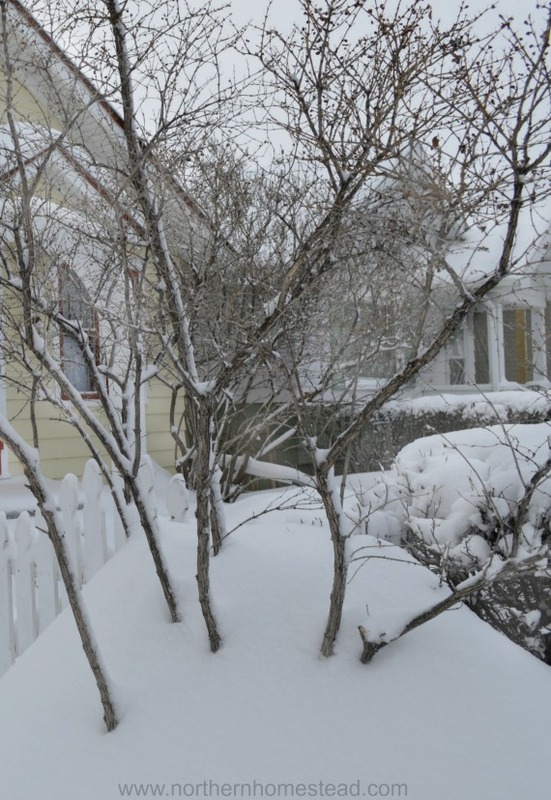 Snow protects and also gives much-needed moisture in the spring. 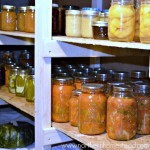 Harvest, cover, and water – preparing the garden for winter is easy, but still very important! 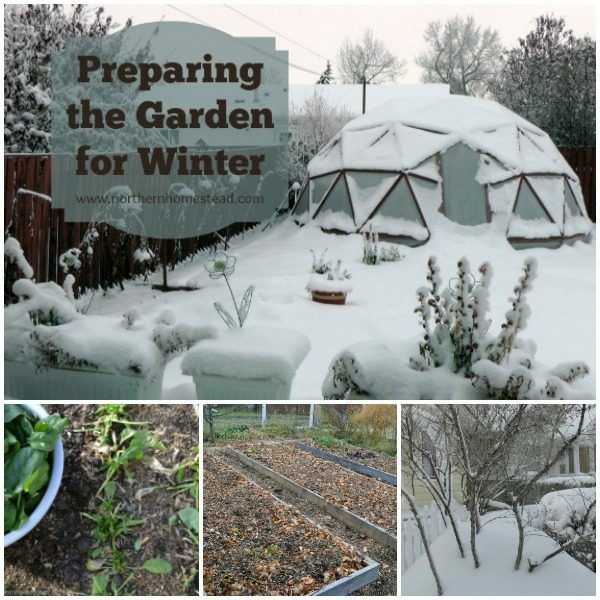 If your weather allows you to continue to grow a garden even in the winter, here are some inspiring books for winter gardening: The Winter Harvest Handbook, Backyard Winter Gardening, Year-round Vegetable Gardening. Anna, you always have some great post about gardening. It’s a shame that I don’t have one! I love the party about God in His wisdom in making the leaves Fall – but we rush to clean them up. Great thinking here! Thank you Zan! Hopefully one day you too will have a garden! If there is an abundance of leaves, why not use them, right! This may seem strange but for some reason, I like to rake leaves. We have such terrible soil on our property, it’s the leaves composting into the beds which have helped all these years. God is awesome, isn’t He! He sure is! Rakeng leaves for compost is totally appropriate. There are lots of neighbors who seem to like rake leaves, I just ask for their bags afterwards to put in my compost ;). Glad you enjoy them and find something helpful for your garden too. You made my day! We so want to be an encouragement, and always happy to hear if what we share is helpful. Great post, Anna! 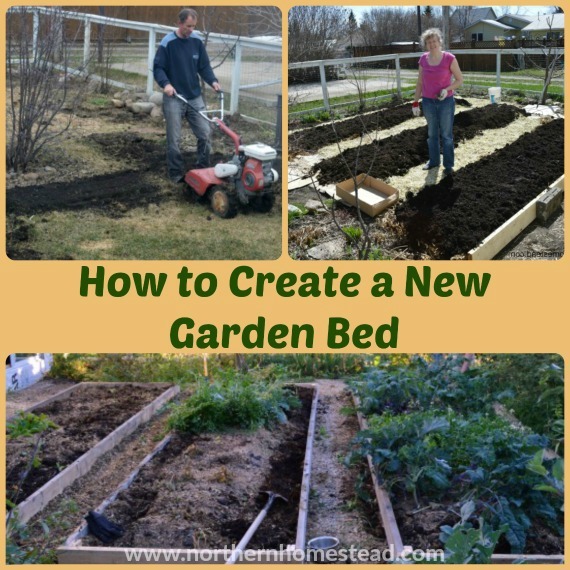 I never knew that you should cover the soil – never thought about it being living and getting cold, too! I am afraid that to many people do not know or think about it. Winter prep is such a big deal here in AK! I sometimes feel like it’s all we do. 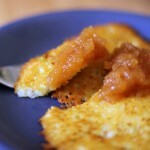 Great list and thanks for sharing at the Homestead Blog Hop! In nature soil is always covered. 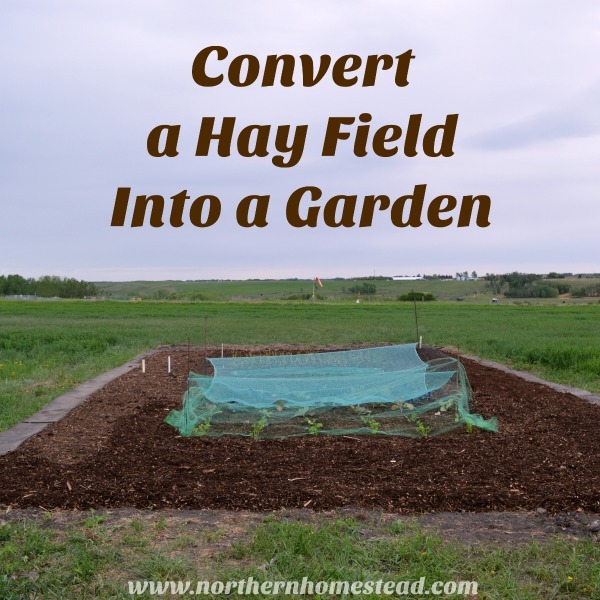 You can grow a cover crop, or use mulch. Snow does act like a cover, too. The idea is to never have soil exposed to the elements. Hope this helps. I’m new to having a garden as this year was my first time. I didn’t know it should be covered for the winter. I have a lot of leaves on my property so will put a layer on my beds. I wonder should leaves also remain on our grass and flower gardens during winter. We’ve always cleaned up leaves in the fall so now wondering if we’ve been wrong all these years. Also an experienced gardener told me to cover my garden with fresh seaweed for the winter so wondering what you think of that idea. Awesome website. So glad I found this great source of information. Welcome Allison! Glad you are finding the information helpful. I have no asses to fresh seaweed, so we just use wood chips or leaves, whatever is available. In the flower garden for the most part the wind does the job for us. I just don’t clean up the leaves, this way the garden is covered and beneficial insects have a place to hide. I do clean the grass though, just so I have more leaves to cover things that I want to be covered.